In “YDIYM” I postulated that if two beings want the same object they can potentially communicate. And if they want the same object that neither can get on their own, they can potentially connect. Above in the symbiotic relationship that’s evolved between badger and coyote we have an example of the former, a relationship which doesn’t reach the level of the latter. 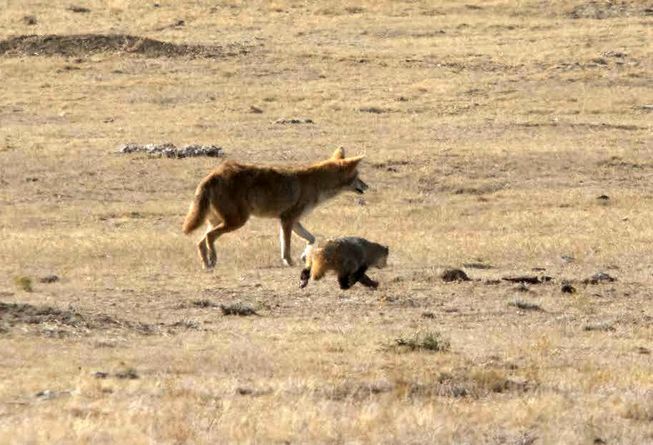 Both coyote and badger can overcome their prey on their own, they don’t need the other to make the kill, but their odds of getting a kill go up considerably if they work together. Neither species modifies its prey-making method, but they modify their hunting style by moving in tandem from site to site. So they don’t actually relate to each other as the article points out. Neither one has any idea of the other’s point of view which should cause the high cognitive approach adherents to question their conclusions from the various dog experiments that they interpret to demonstrate a theory-of-mind capacity. Whereas if they each needed the other to bring down a common prey because it was too large and dangerous for each one singly, then they could evolve to relate to each other and form a truly social connection. Here the connection between badger and coyote is seasonal and doesn’t carry over into non-hunting contexts. A fact that emphasizes how critical hunting is to the evolution of emotion, emotional rapport and the emotional bonds that lead to sociability. So then could we hypothesize that the function of modern human sociability is to serve the “hunt” for a common “prey”/want that is too grand for the individual to accomplish on their own? This seems to align with the idea in personal development systems that one can only truly be conductive in a relationship if they are already complete within themselves and want to attain to something greater (interdependence), otherwise a relationship is based on a need to become complete (co-dependence) and bound to have conflict. I agree. We are driven by stress, it can only return to flow through network integration and so the “configuration” (whatever our social network includes) improves. Not judging others for the stress is the key to integration, letting go of that incompleteness – a who-did-what-to-who-and-when narrative —- converts the stress into Drive, a very structured version of flow.